These dense, soft waffles are packed with your favorite allergy-friendly combo: SunButter and banana. These couldn’t be easier as you literally put all of the ingredients in a blender and then pour into your waffle maker. Great for busy mornings, or on a weekend when you want a hot breakfast. 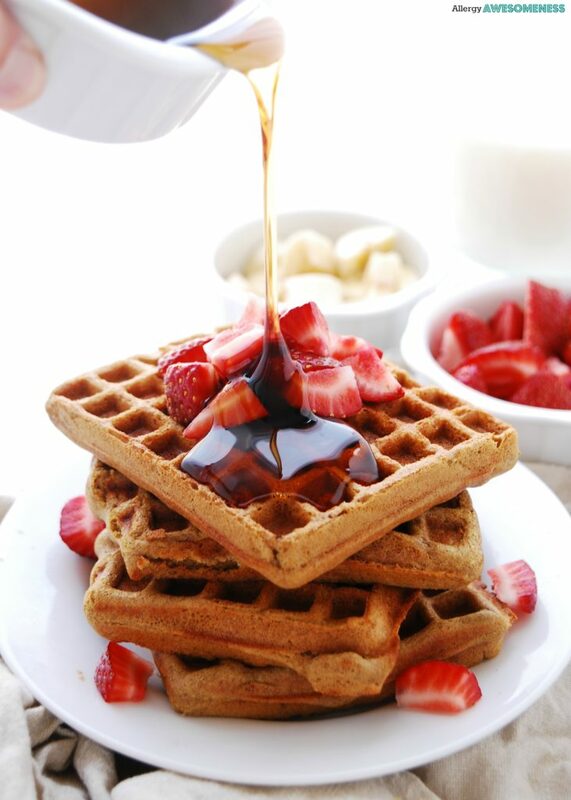 These Blender Buckwheat SunButter & Banana Waffles are free of gluten, dairy, egg, soy, peanuts, and tree nuts. So they’re top-8-free and vegan! Get the full recipe from Megan Lavin here! Megan Lavin’s mantra is: give up ingredients, don’t give up awesomeness. Once Megan’s child was diagnosed with a rare disease, and 30+ food allergies, she started the food allergy site Allergy Awesomeness, to be a recipe safe haven for those with restricted diets. She wants to show others that foods can still taste awesome whether on her blog or when she’s doing monthly cooking demonstrations on TV.